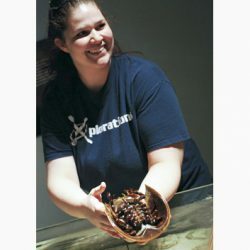 Get up-close and personal with Earth’s largest group of animals as you meet live insects, arachnids, mollusks, echinoderms, and more! Did you know that 99 percent of all living species are invertebrates? Learn how lacking a spine can be beneficial, while exploring the unique characteristics of the invertebrate animal families and the adaptations which help them survive. Hands-on experiences with Museum specimens and live examples of each family allow the audience to get to know these amazing animals firsthand. Book this presentation and discover why exoskeletons are awesome, how shrimp hunt for food, and which invertebrate glows in black light!